A perfectly lit tree is a necessity during the holidays, but the actual execution is easier said than done. With bulb failures, hidden layers on your tree, and different kinds of lighting options available on the market, it’s easy to get lost when it comes to your Christmas decor. 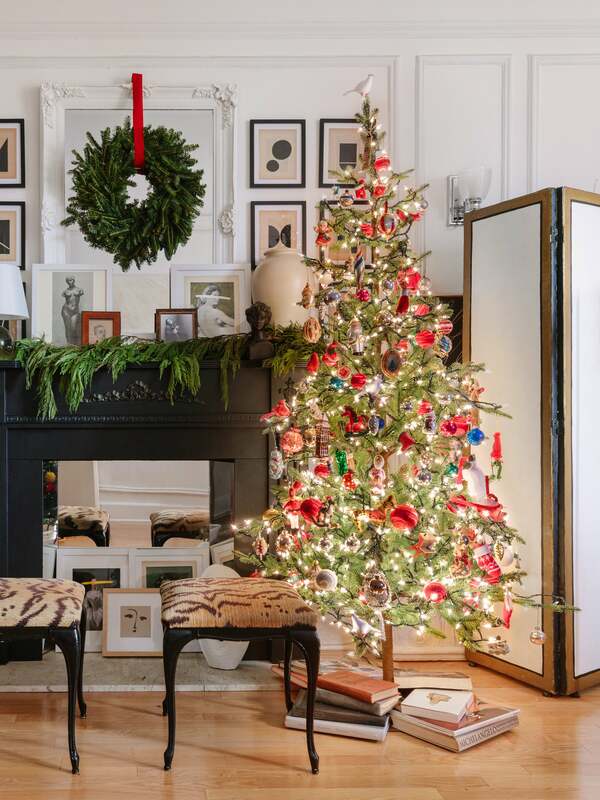 Whether you’re opting for a traditional approach to how you light your tree this year—or an over-the-top rendition that will seriously test your patience but result in an ultra-cool finish nonetheless—there are a handful of things to keep in mind before you start. Figuring out the color of the lights, how many you will need, and how to avoid an uneven display are just a few of the factors you will want to consider. Luckily, we’re here to help: With a little help from the pros, we got the 101 on hanging lights on a Christmas tree, and uncovered some wonderful tips that’ll help amp up your festivities in a major way. There’s nothing worse than winding your way up a tree, only to find out your bright lights are dull bulbs. Plug in every set you plan on using beforehand so that you’re not stuck with a tragic tree. Most experts agree that using a 100-light string per foot is the best way to get a truly twinkly tree. A 6-foot tree would require 600 lights, while an 8-footer would require 800, and so on. Start stringing lights at the bottom of your tree—which is where it’s at its widest. Leave enough slack on your first string so that your tree is already plugged in when you start to wind up. Wind them around the middle. The closer toward the trunk you wind your lights, the better. This creates a brighter showcase and hides them better. It also allows you to add another set if your tree just isn’t bright enough. Can’t decide among white lights, colored lights, twinkly, or vintage? You don’t have to. But in order to master the dynamic look, start with one type of light. Then, fill in as you repeat from the bottom up with your second or third set. Take a step back as you work on lighting your tree in order to see how it’s twinkling from across the room. There’s no shame in adding some extra lights to that bare spot you didn’t notice before. Don’t forget your finishing touches. Rock around multiple Christmas trees. Do you know what’s really trending in the Christmas tree world? Having more than one. “These days, it’s hard to stick to one theme. So, we have clients who have up to a dozen in their home,” says Stephens. We can’t help but agree—the more, the merrier.